Oscar-winning animated duo Wallace and Gromit are to be honoured with a statue in the pair's "birthplace". Bristol City Council has backed plans for the monument, which will be funded by public subscriptions. The statue is the idea of local councillor Terry Cook, who wants to see Wallace and Gromit, and their makers Aardman Animations, recognised. Aardman was set up in the city in 1976 by Peter Lord and David Sproxton, who were last week awarded MBEs. Mr Cook said: "We call upon the Lord Mayor to host a civic reception - with cheese - for Wallace and Gromit and their creators to add the city's seal of approval to their well-deserved Hollywood success. "We further call upon the council to support... a permanent commemoration of the city's highly-inventive heroic duo who have given so much work to Bristolians at their city studios - and so much pleasure to its citizens young and old." Aardman spokesman Arthur Sheriff said: "It may sound a little cheesy but we imagine that a statue of the man and his dog would be quite a good thing. "Unlike most statues, people would actually enjoy seeing them for the simple reason that they are already delightful sculptures and, equally unlike most statues, it could really look good because we could make sure it was exactly right. "We picture a Gromit with a shiny back and nose where thousands of kids have wanted to sit on him." 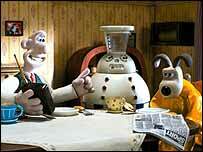 Cheese-loving inventor Wallace and his trusty dog Gromit, were created by animator Nick Park. They have won three Oscars, the latest this year for their first full-length film Curse of the Were-Rabbit.